Your ability to hear is such an important part of everyday life, and for this reason, it is especially important to check on your ears every now and then. There is a common misconception that a trip to the audiologist serves only to address hearing issues. However, one lesser known fact about visiting your audiologist is the way in which your hearing is connected to other aspects of your health, such as balance and memory. Because so many other health conditions are often connected to hearing, this is one appointment you won’t want to miss! Your ability to hear is such an important part of everyday life, and for this reason, it is especially important to check on your ears every now and then. If you have experienced recent hearing issues within the year, this is an especially great opportunity to speak with an expert about possible treatment options and solutions, such as a hearing aid, to alleviate the struggles of hearing loss in the future. It’s true! Your hearing is, in many ways, connected to many other functions of your nervous system.This is especially important if you have recently experienced a recent infection or head trauma of any kind, whether in sports or with an injury caused by an accident. Symptoms such as ringing in the ears and a loss of balance are often indicative of other happenings beyond hearing loss, so it is particularly important to have those symptoms addressed by a professional as soon as possible. In addition to checking your ears and symptoms, your audiologist is also there to answer any questions that you may have about your hearing or ear care at home. 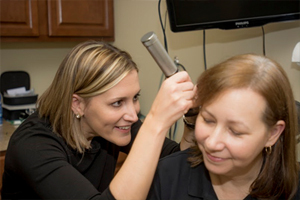 If you need advice or guidance on best practices for ear care, your audiologist has the expertise to help you. Your audiologist may even be able to help you with ear care and hygiene, as attempting to clear your ears of wax at home is often dangerous and can damage your hearing. This entry was posted on Friday, March 23rd, 2018 at 1:39 pm. Both comments and pings are currently closed.